The Milligan family includes, from left, Conor, Steve, AnnMarie and Jack. Becoming a parent is a life-changing experience, and new mothers and fathers certainly feel a sense of hope and aspiration when their child is born. For some parents those aspirations are dashed when their child is diagnosed with an autism spectrum disorder (ASD). Statistically, it is estimated that one in 68 children now have an autism spectrum disorder, according to the Center for Disease Control and Prevention. This condition is more common in boys (1 in 42) than girls (1 in 189). AnnMarie and Steve Milligan, who attend St. Bede Church in Holland, are well acquainted with those statistics because they received an ASD diagnosis not once, but twice. 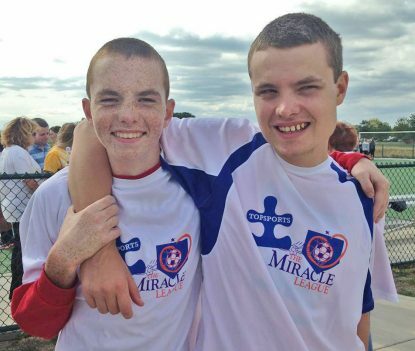 Their sons Jack, now 20, and Conor, 15, also reveal the variations of those on the autism spectrum. While Jack is almost entirely non-verbal, Conor can communicate verbally. “They both have the same diagnosis, but they’re really two different kinds of kids,” AnnMarie said. Managing the challenges of raising their sons has been a team effort for the Milligans, and they have focused on turning any negatives into positives. Steve started the Top Sports program in Bucks County 16 years ago with a small group of children learning how to play soccer. The program now includes basketball and bowling. Both these initiatives highlight their commitment to helping Jack and Conor participate in activities they enjoy and give them valuable life skills. The Milligans had concerns about Jack’s development and took him for an evaluation in 1995, but they weren’t expecting an autism diagnosis. 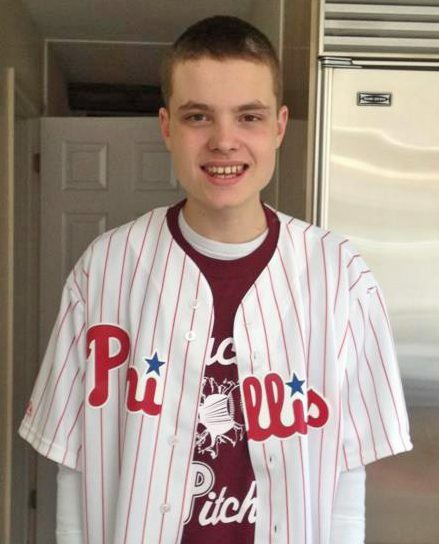 Jack Milligan enjoys going to a Phillies game. Despite their limited knowledge about autism, the couple focused on doing what they could to help Jack. AnnMarie said both of their parents, now deceased, were very supportive despite their unfamiliarity with autism. “From the very beginning my parents were always there for us,” she added. “I can say with confidence that I don’t think my parents really understood. They knew I needed them, and they were there every step of the way. In addition to support from their families, the couple has relied on their faith during the difficult times. “I feel my Catholic upbringing and education, and the discipline that comes with it, helped us with our mindset to handle these situations,” Steve added. The Milligan’s experience with Conor’s autism diagnosis was a bit different because he was verbal and did not have the behavior issues like his older brother. But it didn’t make the diagnosis any easier to accept. 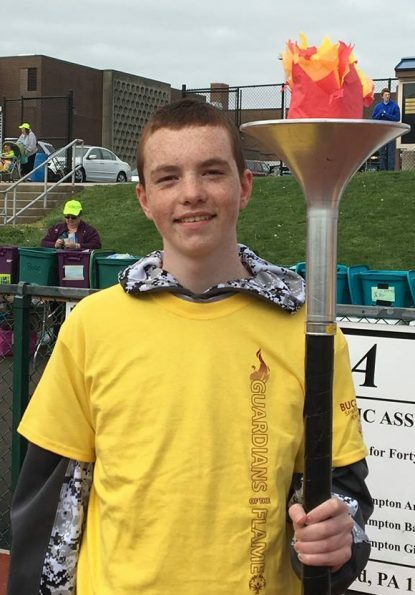 Conor Milligan holds the torch prior to a track meet in which he and his brother competed. Despite their disappointment, the Milligans lined up therapeutic services for Conor and enrolled him in a preschool program that was instrumental in his academic and social development. Steve noted that because Conor was verbal, their parents had a hard time understanding that he was also on the autism spectrum. AnnMarie attributes their response to a lack of exposure to autism. Nonetheless, Steve and AnnMarie’s parents provided invaluable support when they needed it most. 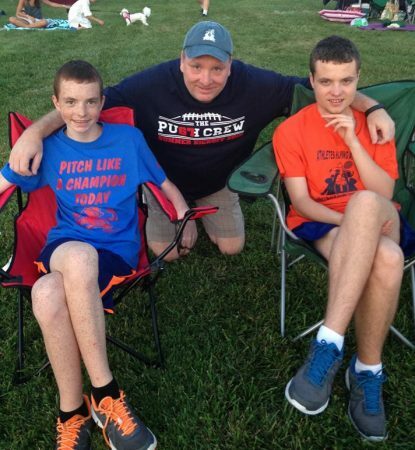 A big part of their autism journey was establishing and running the Top Sports program which gave the couple the opportunity to connect with and help other parents who were facing similar challenges. Although he was initially uncertain about the success of the program, feedback from one of the fathers gave him hope. Conor and Jack Milligan support each other in their dad’s Top Sports program and in their family. Within a few years they had 40 children playing soccer. “Now we get 40 kids for soccer, 60 kids for basketball and 80 kids for bowling,” he said. Top Sports evolved into a win-win scenario for the Milligans. While their goal was to give their sons and other children the opportunity to play sports, they concur that the connection with other parents has been especially gratifying. A homemade gift for a teacher became the catalyst for launching Crafters for Life, LLC. “Jack and I made sugar scrub as a teacher’s gift at Christmas,” AnnMarie said. When the speech therapist at Council Rock North High School asked how easy it was to make, AnnMarie gave the therapist the recipe so she could make the scrub with students. That led to discussions with the high school staff about what type of craft projects students with intellectual disabilities could make and then sell in school. Eventually, the staff asked Steve and AnnMarie and another couple, Mike and Kelly Grant, if they would be interested in forming a company that would give students opportunities to create products and make money selling them. In addition to the sugar scrub, handmade products available through Crafters for Life include wrapping paper, key chains and beverage coasters. The company has a website, http://craftersforlife.com/ where products can be ordered online. The Milligans have focused on working together to handle the challenges they have faced during their 23 years of marriage. The Milligan men, Conor, Steve and Jack, enjoy a sunny day on July 4, 2015. They each handle different aspects of their sons’ lives and do whatever it takes to give them the best life possible. 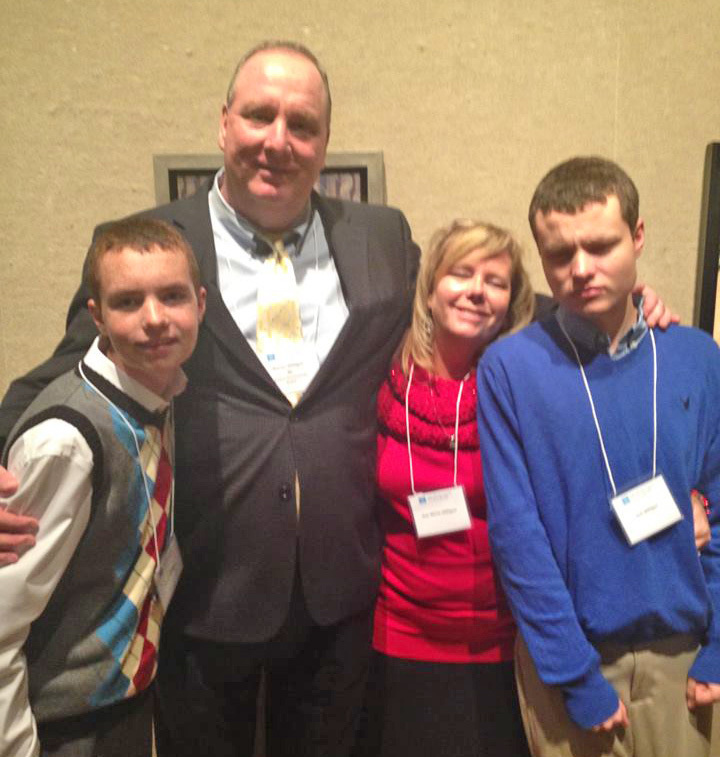 Steve and AnnMarie agree that their sons’ diagnoses changed the couple’s lives in positive ways. “I feel like I would have been less of a person if I didn’t have this experience in my life,” Steve added. Thanks for sharing your story .We all need hope and encouragement,May your blessings continue for life. Peace Love.